Printing bar codes is done through the Inventory menu. The menu item may say "(Eltron Printer)" but it will work with any EPL2 printer. 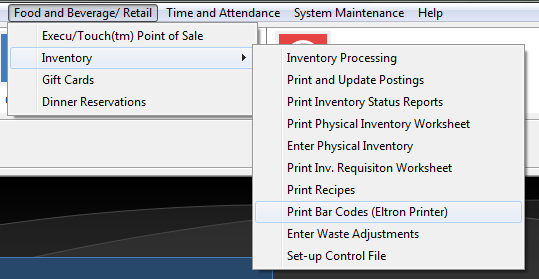 Be sure to select your bar code printer by clicking "File" then "Select Printer" then "Select Printer". Click "Food and Beverage/ Retail", then "Inventory", then "Print Bar Codes". 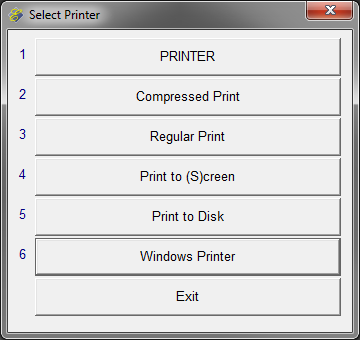 If asked to select a printer, select "Windows Printer" and then select your bar code printer. Location to print: This is the inventory location you wish to print. Press the Enter key for all locations. First code to print: If you want to print a range of labels, this is the first code in the range. Press the Enter key to print all codes. 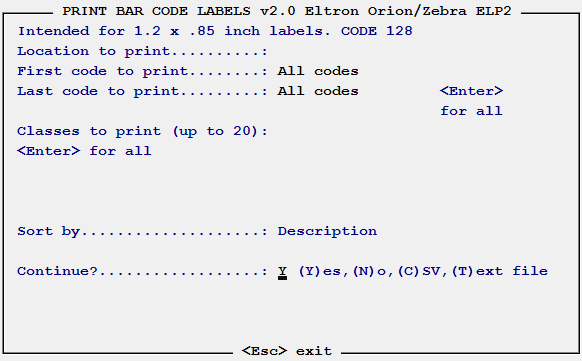 Last code to print: If you want to print a range of labels, this is the last code in the range. Classes to print: You can enter up to 20 classes of codes to print. You enter one, then press the Enter key and repeat. Press the Enter key without entering a class to print all classes. Sort by: This lets you sort the labels by Description or Bin Number. Select from the popup box. Print STOCK quantity? 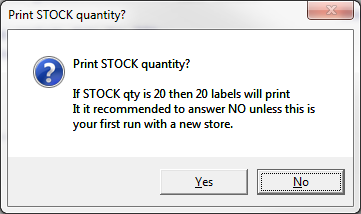 This popup box asks if you want to print the stock quantity. It will print 1 label for each item that inventory says you have on hand. It's recommended to only do this if this is the first label print run for a new store and you are confident that you need the labels. Continue? Yes or No, or you can save the results as a CSV or Text file.